Corn Au Gratin - this homestyle casserole is a delicious way to serve corn. 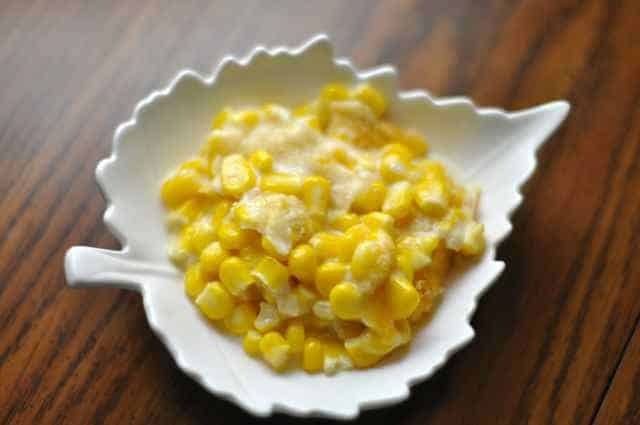 Home » Casserole Recipes » Corn Au Gratin – this homestyle casserole is a delicious way to serve corn. Corn Au Gratin – this homestyle casserole is a delicious way to serve corn. This corn casserole is one that I grew up with. Corn in a basic white cream sauce along with cheese and toasted cracker crumbs. This dish is perfect to jazz up a package of frozen corn. Corn Au gratin is a great way to serve corn. Prepare the white sauce by combining in a small saucepan the flour and the butter, cook together until all of the butter has melted, and the flour is combined, cook for about 1 minute before adding the milk. Stir continuously until the sauce thickens. Add corn, mix well. Combine in buttered casserole, sprinkle with crumbs. Add corn mixture, and top with grated cheese, and top the casserole with some additional cracker crumbs. Bake at 350 degrees for 30 minutes. Is it breadcrumbs? Or is it cracker crumbs? Or both? We know have our missing white sauce.